Well today I am off to Boston to go with my husband to a Stephen King lecture. He lets me indulge in my hobby, so I have to allow him to indulge in his! I'm excited to get to explore the town of Lowell while I'm there. Before I go, I wanted to show off another card I made using the Scentsational Season stamp set. I got this idea from a card I received in a swap at the Rhode Island regional event. Sadly, I cannot remember who it was that gave me the card. It's such a cute idea and a fun way to use the mitten punch - to make oven mitts! I used River Rock for the card base on this card and made it tri-fold. I think River Rock is the color I use the least so it was nice to include it on a project like this! When I get home from Boston, my Spring Catalog and Sale-a-bration pre-order should be here. 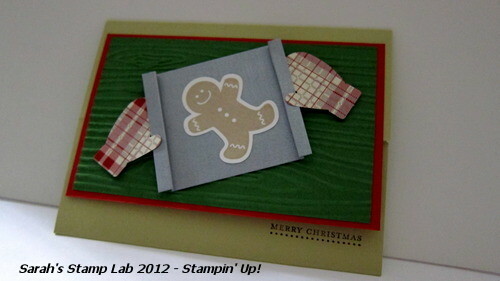 Get ready for some sneak peeks thrown into the mix of holiday projects! I know how much you all love sneak peeks!